The American South is the source of countless talented guitar-slingers, but not many get the chance to hit the big time. But, through hard work, endless touring, and incredible talent, Damon Fowler is all set to make the jump. This Florida native has been working his solo act for years, and is also a member of the southern roots rock group, SoHo, alongside JP Soars and Victor Wainwright. Their work is highly-regarded, and it shows that Damon has the versatility to perform equally well as a solo artist or with a group. Sounds of Home is Fowler’s third solo release on Blind Pig Records and he pulled out all the stops to make sure it was a success. His best decision was to bring Louisiana legend Tab Benoit onboard as producer. This album was recorded and mixed by Benoit at his own Whiskey Bayou Studios, and he also contributed his songwriting skills and a bit of his wonderful guitar prowess. It contains 11 tracks, with seven originals that were penned by Damon and his seasoned writing partner, Ed Wright, along with a little help from Tab. The guitars and vocals were handled by Fowler, with Chuck Riley on bass and James McKnight on drums. The first track up is ”Thought I Had It All” and the listener gets a strong dose of heavy southern rock. Damon Fowler delivers the vocals with a bit of a southern accent and his voice is strong so he does not need to strain to get his point across. Up next is the title track, “Sounds of Home,” which is a slick piece of blues rock, with a rhythm section that could have been lifted straight out of a 1970s Robin Trower album. It should be noted that the vocals on this track were shared by perennial Mardi Grad favorite Big Chief Monk Boudreaux, which makes for a neat addition to what was already a cool song. Damon also includes a few country-inspired songs on this album. “Old Fools, Bar Stools and Me” takes on the classic theme of drinking away heartache, but uses a hard punch of heavily processed guitars to get the message across. “Where I Belong” is a catchy tune with fancy fingerpicking and slide that does a good job of evoking images of home. “Do It For The Love” is the standout track on Sounds of Home, as this ballad has sublime lyrics that are interwoven with wonderful interplay between Fowler’s guitar and Benoit’s slide work. The two covers are not the usual suspects, and they include an unexpectedly faithful rendition of Elvis Costello’s “Alison” and a hard hitting version of Johnny Winter’s “TV Mama.” Fowler electrifies Winter’s 1977 song with well-placed lead and slide guitar licks, which are more than fitting for the slew of double entendres of the original version. This track highlights his backline, which features Riley’s chugging bass line and McKnight’s drums, which are heavy and perfectly recorded and mixed. The album ends up with “I Shall Not Be Moved,” a traditional spiritual, which seems right at home amongst the southern-fried rock and blues that make up the rest of Sounds of Home. It starts out with Damon singing along with a fun fingerpicked riff, and then he is joined by the bass and drums and some perfectly sweet vocal harmonies courtesy of Tab Benoit. It was clever to put this song at the end, as it is different enough from the rest of the material that it provides a clearly defined finish. 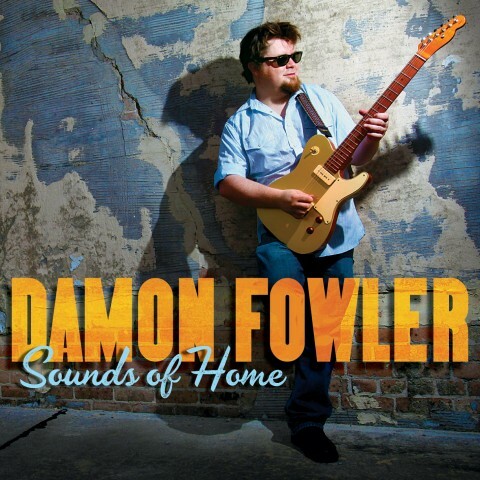 Damon Fowler should be proud of the work he put into Sounds of Home. All eleven tracks are solid, and it is obvious that he has mastered the art of blues and swamp rock performance and writing. Check out this album for 50 minutes of top-shelf entertainment, and be sure to hit his website at www.damonfowler.com for tour dates, as he will be making his way around the country this winter and spring.